Kellan was the first knit Manga Spirit that I made. 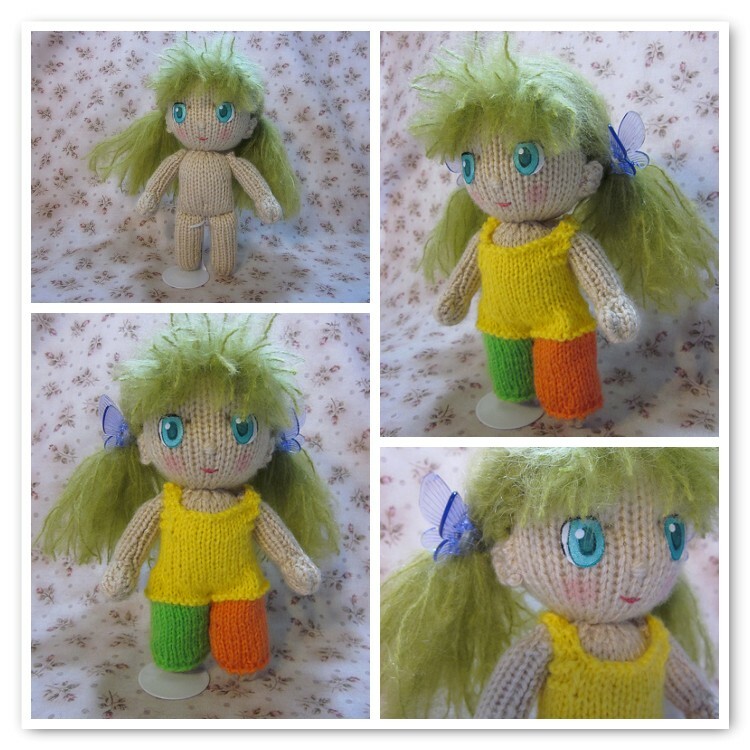 I love her impish smile and green hair, but wasn't happy with the neck spacer, so the pattern was tweaked, and the knit Manga Spirits now have a smaller neck spacer. 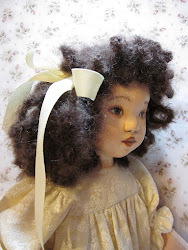 But here was Kellan, wanting to be a real doll too! So, I took off her head, removed the spacer, and ladder stitched the head back on. It doesn't move, but she doesn't mind, and we are both happier with the way she looks. To keep the chill off on these early spring days, here is a sweater to crochet or knit for your Manga Spirit. Click Manga Spirit Sweater to access the download for this sweater. 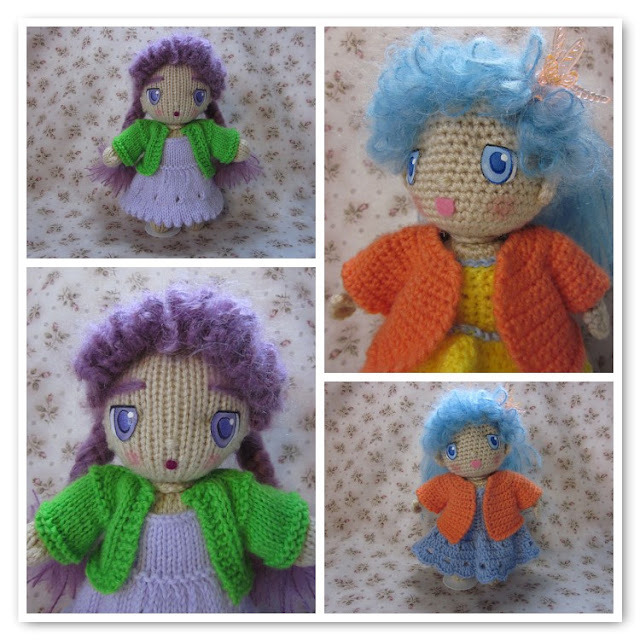 The sweaters are made from sportweight yarn, using a D hook for the crochet sweater, or size 4 (3.5mm) single point needles for the knit sweater. 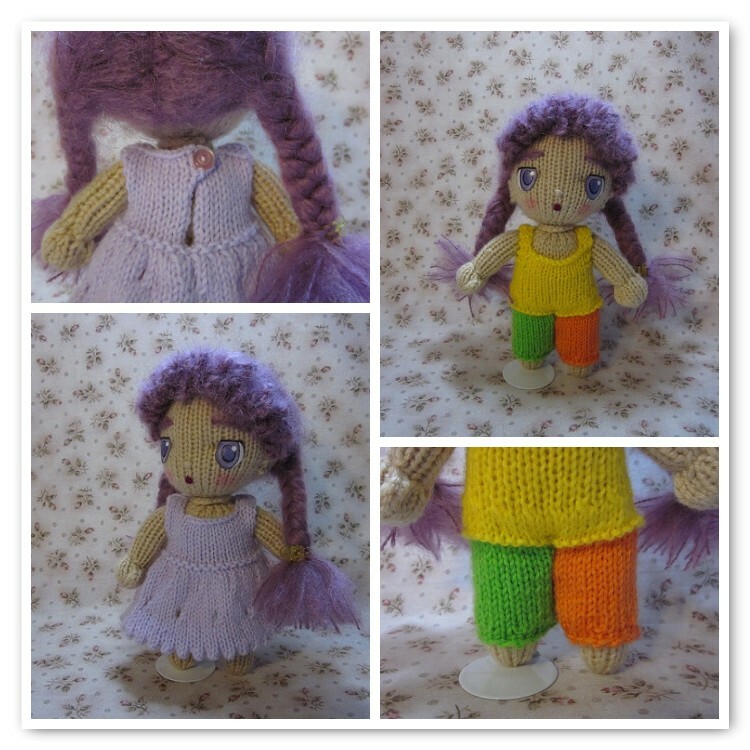 A simple knit dress and rompers for your Manga Spirit :-) This will fit either the knit or the crochet doll. Both are knit with sportweight yarn and size 4 (3.5mm) single point needles. The dress has a pretty little picot hemline that is accomplished with eyelet stitches in the sixth round, then the hem is pressed up and sewn. 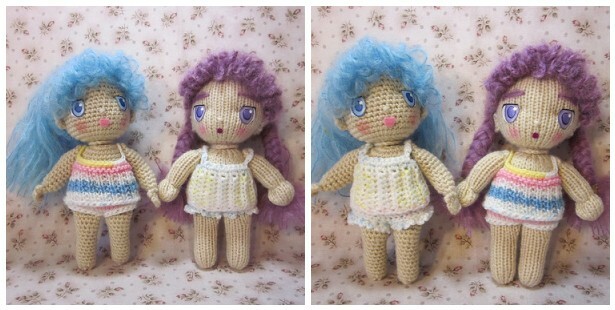 Some simple styles to crochet for your Manga Spirit, based off one basic bodice pattern. I love this side-to-side bodice, is is infinitely adaptable to dresses, tops and even rompers. 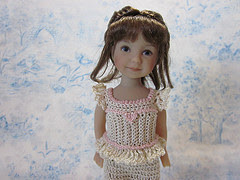 The outfits are crocheted with sportweight yarn and a D hook, and make up very quickly. Have fun with these! 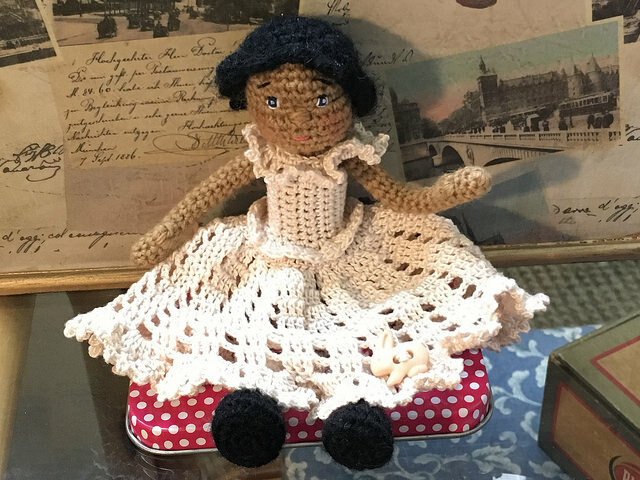 One last note: a good Flickr friend of mine, Lorraine, introduced me to an incredible site filled with links to free amigurumi patterns. I've place the link into 'Blogs I Enjoy' on the left sidebar; you can access it here as well. When I make a new doll, I like to start with underwear as the first pieces of clothing. They create a good foundation for beginning, giving me an idea of how many stitches are needed to fit around the waist, how many rows are long enough for a top, how large does the armhole opening need to be...you get the picture. From the basic camisole and undies, all the other clothing pieces can be worked out. 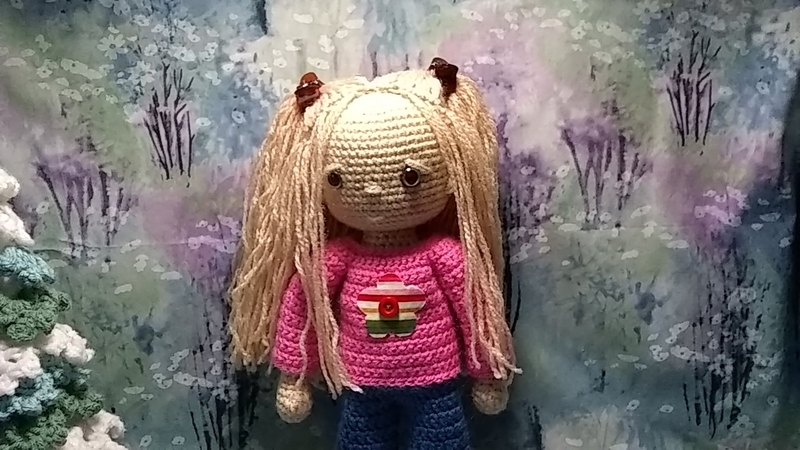 After a little bit of trial and error I can now share the pattern for a Crochet and a Knit Manga Spirit doll :-) The Spirits are a shade over eight inches tall, and very simple to either knit or crochet. 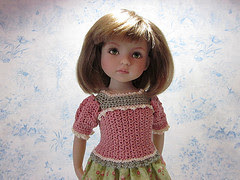 There is a tutorial available on my Flickr site for making their eyes. 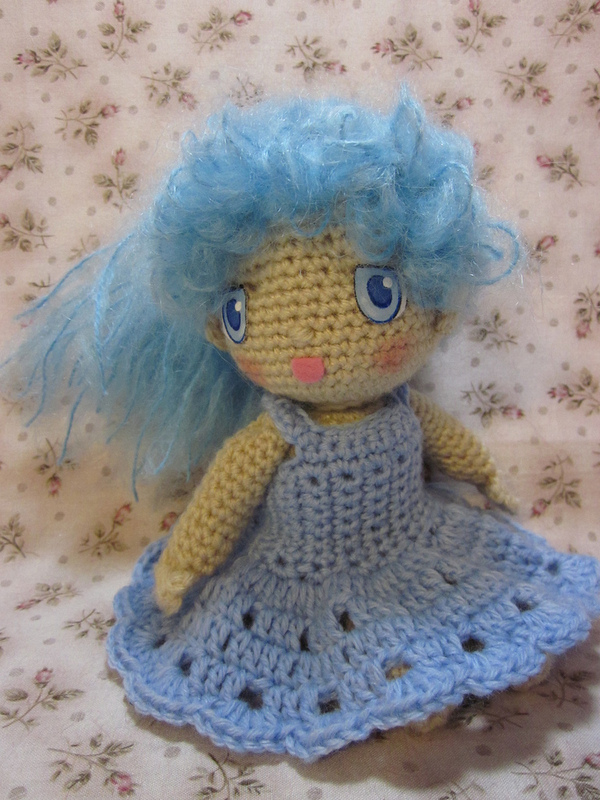 You can find the pattern by clicking Crochet or Knit Manga Spirits. The heads are button jointed to the body, which is a simple and inexpensive way to get a move-able head. Move-able heads are amazing fun to play with and pose. The legs are swing jointed to the body, and feet and hands are very, very simple (or nonexistent, in the case of the feet! Shoes will provide foot definition). Coming soon will be some clothes, so they don't have to hang around in their birthday suits. 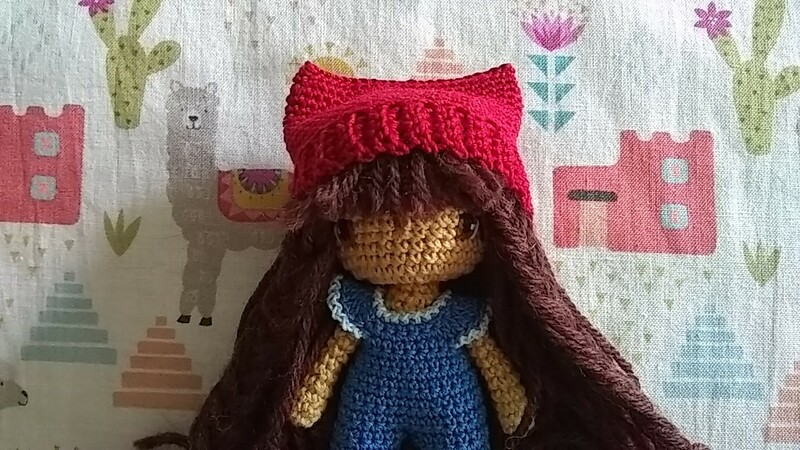 Hope you enjoy the knit and crochet!